So, I bought an unfinished piece of thin birch wood to spur on my creativity. It was roughly three inches by eight inches. At the time, I had no specific plan. I just wanted to create some kind of wall art. I did know that I wanted it to be rustic and at the same time inspirational. Since anything with birds tends to make me happy, I narrowed my thoughts down to something with a bird. Using only materials that I already had in my craft room, I ended up with this DIY bird wall art. The first thing that I did was to draw out a rough sketch of how I wanted the end result to look. Using paper the same size as my wood, I laid out where I wanted things to go. I wasn’t super specific in how I wanted my branches to go. However, I knew I wanted to frame the wood with birch branches. I basically started my design from left to right so I went to work on my word first. With pencil, I drew out the whimsical lettering. Then, I went over the pencil with my wood burning tool. Since I also included a couple of leaves coming off the letter g, I painted those in with a light green paint. Before going any further, I lightly painted over the wood with a white acrylic paint. I brushed it on very lightly to give more of a whitewashed look. I probably could have done this before I did the wood burning but it wasn’t hard to work around the wood burned letters. To create the bird, I first drew out a bird outline on a thick piece of textured paper. I just drew the outline freehand but a stencil would work good for this too. After drawing, I cut out the bird and then painted it with acrylic paints. I just swirled some yellow paint onto the body and painted stripes for the wings. To make the bird a hard object, I then covered it with Mod Podge dimensional magic. It gave the bird a nice hard and glossy surface. To make the bird stand out from the wood a little, I glued a button to the back of the bird and then the button to the wood. I wanted it to stick out a little so that it could perch on a branch. Next, I constructed a small leg and foot using thin florist wire. Then, I glued the leg to the bottom and back of the bird. This is how I was going to perch the bird onto a branch. I then added a small branch to the wood at the bottom of the bird where the foot rested. To add some interest to the other side of the wood, I applied a small floral pick. To give the impression that the sun was shining on the bird, I added a little shimmering glitter to the bottom of the wing and the end of the branch perch. The last step was to frame the whole piece of wood with branches. I added a couple extra small twigs to give additional style. Once I was happy with the framing, I attached wire to the top branch for hanging. 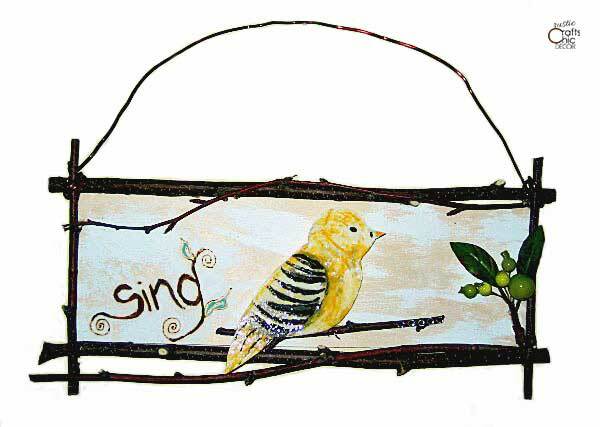 To see some more fun bird art, check out my painted canvas craft.